Have you ever found yourself cursing over unevenly cut soap samples? 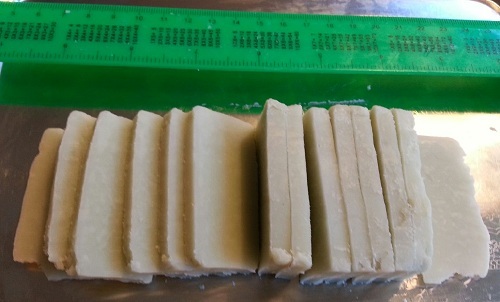 Ingenious soapmaker member Leanne Laboy has just the trick. Looking for a way to manage the different soap weights she needed to cut, inspiration struck her from the shelves of a kitchen store. She never intended to go into business, but “I started selling when my stash reached about 700 bars and my husband told me, ‘Leanne, we got a little problem here’”. Today, she offers a wide range of skin-friendly treats including lotion sticks, lip balms, soaps (for vegans, sensitive skin, shaving, and much more) as well as accoutrements like travel-friendly crocheted soap savers and handcrafted soap dishes through Leanne’s Homemade Natural Soap. Find out about her upcoming craft fairs and make special requests through her facebook page. Thanks for sharing this awesome tip, Leanne! Your turn: what kitchen item have you appropriated for soapmaking? This is a brilliant idea! I have been using one of these butter cutters for a few years now. It’s great on freshly made CP soap for cutting sample bars. Try to cut on harder cured soap and you are in danger of bending or breaking the wires, so it must be soft enough to cut easily. Thanks, Gill, that’s a great reminder about not trying this on cured soap. Nobody wants a wire in the eye! great idea. Dean has made similar soap cutters using fishing line for cutting on a wooden frame he made. Fishing line is cheap and is the best material we have found for cutting soap. That’s amazing – who’d have thought fishing line could stand up to soap? !